Little is known about this country congregation east of Salem. The area was named for Christians John and Temperance Howell. Some who later lived on Howell Prairie attended church at Scio and Silverton, but there was a congregation meeting on Howell Prairie also. 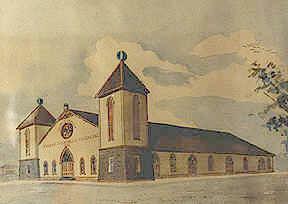 C. F. Swander lists its beginning as 1847, making it the fifth church started in Oregon. Alexander McCarty reported 85 members after completing his gospel meeting in 1853. This story continues with the next entry. Stephenie Flora lists the Howell family in her 1843 list of pioneers. Note: On the Mapquest map, the site is at the intersection of Howell Prairie Road SE and Ashdown Court. This is east of Salem off State Street. Late in 1999, new evidence began to emerge for a church (or a second church) on Howell Prairie. 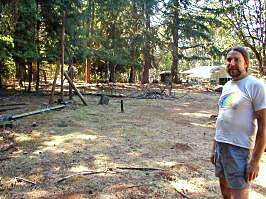 Llama trainer Ken Ploeser found a broom buried on his Wily Woods Ranch on Howell Prairie Road east of Salem near the village of Macleay. It was labeled "Antiok Hill." Old timers in the area say a church stood at one time on Ken's property. In fact, there exists an old photo of a man pointing to the location where the "Antiock Hill Church" building once stood. Link to Ken Ploeser's Wiley Woods Ranch. 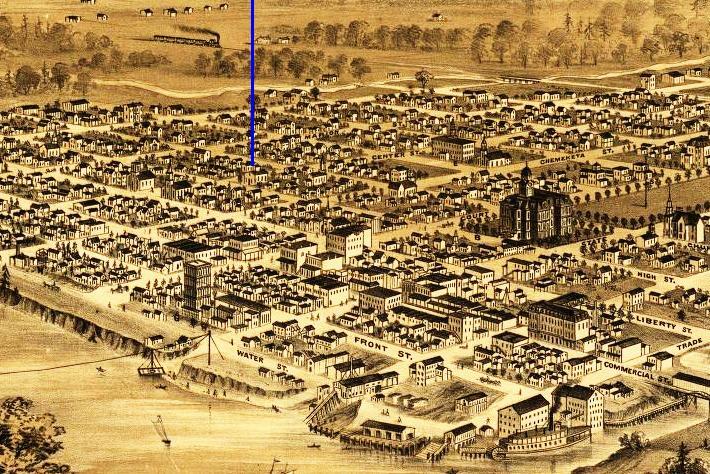 Historical writer Clarence Swander lists an Antioch Church beginning 1863 but the location was unknown to him. Historian Doug Dornhecker lists an Antioch church in Marion County with 50 members. That was from a report for 1871. Perhaps the Antioch Church was located on Howell Prairie Road at Ashdown Ct. Recent research has demonstrated that overlander Caleb P. Chapman settled, along with his family, at near by Rickey on Macleay Road SE. This was his first stop in Oregon. He may have been a moving force in starting this congregation. He later moved north to a location on Howell Prairie and was involved in starting the Bethany Church. If Chapman was involved at Antioch, we can push the beginning date of this congregation back to about 1850. There is a profile of Caleb P. Chapman on this link. One pioneer family that was won to Christ on Howell Prairie had a son that left a lasting impact on churches and schools in Oregon and Washington. Bruce Wolverton was born while his family was crossing the prairie in 1853. He was number three in a family of seven children. By 1868 the senior Wolvertons had become Christians. Bruce chose Christian College in Monmouth for his education. After graduation, he is seen preaching at McMinnville, in 1880 at Portland, in 1883 at Seattle, in 1884 at Tacoma, in 1885 at Dayton, Washington and then he became the first Superintendent of City Schools at Spokane. His preaching work was focused on holding nightly meetings and getting churches started. He was indeed a mover and shaker for the Lord. The Bethany Church near Silverton in Marion County began in 1851 according to Marceil Middlemiss, local church historian. Organized on the banks of the Pudding River, the church had several names, depending on who was keeping the church minutes. Besides being known as the Bethany Church, it was variously called Bethany Christian, The Christian Church of Bethany, Silver Creek Christian and the Church of Christ at Bethany. The congregation later changed location and is known today as the First Christian Church of Silverton, a congregation affiliated with the Disciples of Christ. The church began on the fourth Lord's Day in April, 1851 with 27 members. A key leader in those years was Elias Cox, great-grandson of Elijah Pope, a former Baptist preacher from Kentucky. Under the preaching of Alexander Campbell, a number of Baptist Churches in Kentucky accepted the challenge to restore the church to its original purity and Elijah Pope was among them. (So were the parents of Abraham Lincoln.) Now his example lived on through his namesake, Elias Cox. The first building (pictured above) was built on his land in 1858. After the building was in place, the first preacher was Caleb P. Chapman. The attempt to identify with the work of Alexander Campbell can be further seen in that Campbell was the Postmaster of Bethany, West Virginia, its best known resident and President of Bethany College. The name was undoubtedly the inspiration for the local Bethany Church name. Many of the pioneer members of this congregation are buried in the Bethany Pioneer Cemetery near Silverton. The congregation reported having 75 members in 1871. F. B. Bonnell came as the preacher in 1889. It was here at the Silverton Church, many years later, that the then venerable Glen Burnett preached his final sermon. "Being too weak to stand, he sat while preaching. The congregation was visibly affected and many wept." Today the congregation owns a sizeable building near the center of Silverton. The minister, Dale Moore, has completed 30 years with the congregation. The name Salem is an anglicized form of the Hebrew word shalom, meaning peace. It was John Rigdon and Alex McCarty who organized the handful of worshippers meeting in the Court House in 1855. This was one of the four earliest Protestant churches organized in Salem and four years before Oregon was admitted to the Union. There are profiles of both John Rigdon and Alex McCarty. They moved from the Court House to the Masonic Hall . With "Mac" Waller as their leader, they moved to the Little Central School building. 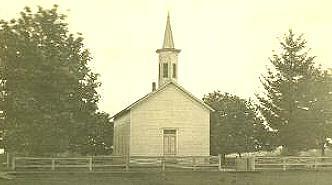 The church organized permanently on August 2, 1867. Peter R. Burnett was called as the minister. Before the year was out they built their first permanent home at High and Center Streets, affectionately known as the "Little Brick Church." Burnett reported "nearly 100 members" in November of 1868. This building location is marked on a panoramic view of down town Salem. In a report to the Christian Standard the building was said to be "36 x 55, nicely cushioned and carpeted, with a room in the rear 20 x 36 feet, for society purposes with a baptistery connected with the main building, with folding doors. We have a membership of about one hundred and fifty -- have had over 20 additions within the last few weeks. " "Whenever we mention this building, where our people met to worship for so many years, a tide of precious memories rushes in to thrill our hearts with bygone things. There seems to come before us, in life-like guise, a long procession of those who were prominent in church work in those years. The earnest ministers who sounded out the pure gospel, the many who came to Christ under their teaching, elders, deacons, men, and women who had joyful fellowship in Christian work. Some shadows too, but redeemed by the sweetness of those times. Then, as a moving picture, scenes of confessions, baptisms, marriages, receptions, and goodbyes, and it is only meet that we pause and pay a passing tribute to those in former times. We bade the old church good-bye, when it became apparent that we needed more space, better equipment, etc. We saw the walls fall, and the ground cleared for the new structure, but many of the stout old bricks were built into the foundation of the new building." Certainly the bricks were symbols of building the present on the structures of the past. Mrs. Hull says the rules of conduct at that time were exacting. "The records show that many names were dropped from the roll for dancing, worldliness, gambling, horse racing, 'uncouth language,' disorderly conduct, etc. The elders met and acted, and the names were 'stricken from the roll.' That was the term used and has quite a terrifying sound." Peter R. Burnett was called as the first full time minister . . . . Baptisms were in Mill Creek near the S. Commercial Street Bridge. There was a charter membership of 75 by September 10, 1867. Mr. Burnett returned two other times over the next 21 years to guide the Salem congregation. In 1881 they reported a membership of 112. Pioneer George Lemuel Woods, third governor of Oregon State, had served as an elder, preaching on occasion. George Woods had studied under W. L. Adams and at Bethel College. His mother was the sister of Dr. James McBride and he also married his half-cousin Louisa McBride. The State of Oregon has mounted an official biography of G. L. Woods at their site. There is an article by Jerry Rushford about the life of George L. Woods. R. M. Messick, the minister in 1894, was born and raised in Nicholasville, Kentucky. He had attended Campbell's Bethany College in West Virginia in earlier years. The efficient labors of Bro. P. R. Burnett is carrying the good work forward in a sure and steady manner. Brethren S. C. Adams and Leo Willis supplement his labors in the pulpit. A steady interest in maintained in the Sunday school work, the prayer and social meetings are well attended, and the young members have regular meetings for devotional training. The membership at present is 130. Among the famous pioneer preachers have been Burnett, L. L. Rowland and Alexander V. McCarty (1825-1876). Pictured at right is George C. Ritchey, minister at Salem from 1901 - 1903. The congregation has built a modern facility and works closely with the Disciples organization. There are other Independent and a capella congregations in Salem. As a historical note, Oren Knowlton launched a church in West Salem (Polk County) in 1957. Gordon Ross also preached there for a period that year. While this note is outside of the range of our pioneer work, it serves as a permanent record of a now-forgotten church-planting effort. The photos and records pertaining to the Mill Creek and Stayton Churches have been graciously supplied by Bill Gilson of OLÉ. In 1855, a group of pioneers established "The Church of God, Mill Creek Congregation." The original building was a 16' x 20' schoolhouse that stood on the north portion of the William Porter Donation Land Claim, about one mile southeast of Aumsville and approximately four miles northwest of Stayton. This appears to be about the 8800 block on SE Bishop Road. The congregation was organized by George W. Richardson of Scio. There were 50 members (where did they sit?) including William Porter, John and Adeline Foster from Carver, and Henry and Julia Turner for whom Turner, Oregon was named. Some of the earliest preachers included Richardson, John A. Powell (of the Central Church near Albany) and George Whitney. By 1862 the congregation had grown to 81 and was called the "Mill Creek Congregation of the Church of Christ." The first baptism was that of J.W. Shaff, also in 1862. A larger building had been built in 1858 and it was used for 10 years before the church moved to the Aumsville Schoolhouse. I commenced my labors at this place a little over a year ago. At that time the church was in raather a low condition; but the brethren are now much revived, and I have immersed about 30 persons, and have received several from the sects, and several have been reclaimed. We had three immersions last night. The Christian Record, November 1873, page 521. 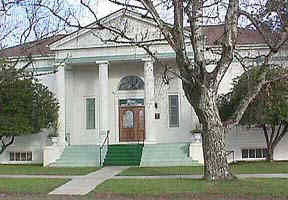 We had a good meeting on last Lord's day, at Aumsville, Marion county, Oregon. We had two additions to the church -- one from the Baptist and one by confession. Bro. K. Bailes assisted in this meeting. The meeting at the grove between Aumsville and Stayton commences on Friday before the fourth Lord's day in June. We expect a good time. All are invited. There is a beautiful place at the grove for persons to camp out; besides as kind a brotherhood as you will find to take care of any persons wishing to attend the meeting. So come all and let us have a season of rejoicing from the presence of the Lord. The church reported 73 members in 1881. At that time, Henry Smith and Oliver Perry Taylor were the elders. A building was built in Aumsville in 1884. The Turner Tabernacle is said to be the outgrowth of the Mill Creek Church. 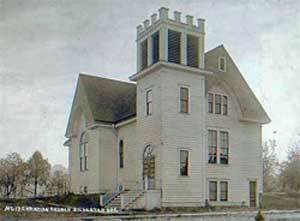 The story of the Mill Creek Church continues below with the Stayton entry. Pioneer Reminders: Schaff Road, Porter Road, Turner Road. As the Oregon & California Railroad building southward developed their rail stops, they sent a crew to erect a station and warehouse a few miles south of Salem and name it Marion. The crew did as directed, but built the station in the wrong place. Marion remains 6.5 miles south of where it belonged. A second station was built at the location first intended by the rail company and named Turner Station, after Henry Lewis and Julia Ann (Sharp) Turner, Christians and prominent local landowners. Mr. Turner was born in New Brunswick and, with Julia Ann, was a pioneer of 1852. Since those years, Turner, has been an important center for the instrument-using Restoration churches in Oregon. 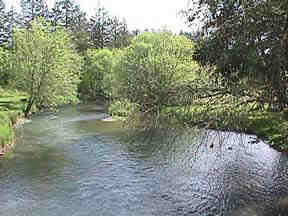 The Turner family donated six acres for a camp grounds on the east side of Mill Creek in 1878. Photo of original architect's drawing. Coinciding with the development of Turner on the rail line is this notation in the May, 1887 minutes of Salem First Christian Church. Delegates are instructed to locate a place for the "annual meeting" that was accessible by railroad. So probably folks arrived at Turner by train in the years before the automobile. Portland, Salem, Albany, Eugene, Cottage Grove, Roseburg and many small towns were on the rail line. The "annual meeting" was held here in 1885 and by 1891, Turner Memorial Tabernacle had been constructed at a cost of about $5,000. A building 110 x 160 feet, it currently seats 1,500. Straight-grained lumber from the Turner family mill was used throughout the structure including the pews. The building is a post and beam (also called timber frame) type structure, held together by wooden pegs. No nails were used in construction except on the siding. The floor is supported on short posts, each sitting on one of an estimated 81 boulders. According to the late David Davis, these special round rocks, not native to the area, were once used for ballast on lumber ships plying the coast. They were moved here by railroad for use in this foundation. . . . . Saw a good many that I have been acquainted with, some that I crossed the plains with. It was a grand sight. There was acres of people. Father & Mother Turner gave (the) church a magnificent gift. It is the largest chapel I ever saw. It was built and furnished ready to occupy costing ten thousand dollars. He refers to Robert Callison and his lady, Polly Bristow Callison. Robert was an elder at Pleasant Hill. The building was lighted by coal oil lamps until 1912, when electric lights were introduced. Until the 1940s, the plank flooring was covered each summer with fresh sawdust, perhaps to extend the era of the "sawdust trail." After a hundred years, the Tabernacle is still in use, updated with carpeting, fluorescent lighting and overhead infrared heaters. A look back at the original drawing will show the building had two towers, but the east one one was damaged in the Columbus Day storm of 1962 and removed. The Tabernacle is being restored and brought up to its original specifications plus meeting current codes. In 1915, the Convention was overshadowed by the death of R. G. Callison, who died on the platform in the middle of his address. His sermon was entitled "The Work of the Pioneer Minister." The Christian Standard reported the story as follows. "He (Brother Callison) stated that he never prepared men to die, but to live; that any man who was prepared to live was prepared to die. He started another sentence with the words, 'Paul said . . .' when he suddenly fell to the platform under a stroke of apoplexy, and in about three minutes he had gone to prove the truth of the last statement his lips had uttered." The History Of The Oregon Christian Convention At Turner, Oregon, 1993. An unpublished research paper by Clare B. Buhler. WHEREAS, there is a widespread feeling among members of those congregations known as Christian Churches, Churches of Christ, and Christian Church (Disciples of Christ) in the state of Oregon that there is a need for more general fellowship in their common effort: (1) to promote the general welfare of the local church; (2) to encourage the spread of the gospel of Christ in the world; (3) and to provide occasions of inspiration, learning experiences and fellowship in the mutual concerns and endeavors on behalf of the church . . . The Disciples of Christ wing of the movement was active in the affairs at the Turner Convention until about 1956. Since then, direction has passed to Independent churches. According to a published letter by Ellmore J. Gilstrap to James Matthew Alley, the original Turner Christian Church building was built by Cornelia (Turner) Davis and deeded to the congregation. Besides the annual convention and the Christian Church, Turner Retirement Homes provides a variety of living options to seniors. There are more than 170 retired members of primarily Restoration churches. The facility, licensed by the State of Oregon, is just three miles from I-5 at exit 248. Because Turner Retirement Homes is housing dispersed throughout Turner, it is difficult to picture. We have chosen Davis Hall, the Administration building, to show the stability of the organization and Mill Creek to show the serenity of the area. For further information, contact Angie Bartel, Director of Public Relations, by E-mail. Their ministry gives meaning to Psalm 71:9, "Do not cast me away when I am old." Pioneer Reminders: Turner Road, Turner School. In an 1871 report, the congregation lists 12 members. It was probably a new congregation shortly before that. Bro. H. M. Waller has been employed by this church for the first Sunday in each month during the summer. He was with us last Lord's day, the congregation was large and the best of order prevailed. He preached at 11 A. M. and 2 P.M. One made the good confession. The church met in the Rock Point school house. Mehama Mapquest At the red star. There was a Christian Church there in 1881. Disciples Historian Clarence Swander lists the beginning as 1925, but a group had reported to the Christian Messenger from Mehama more than four decades earlier. 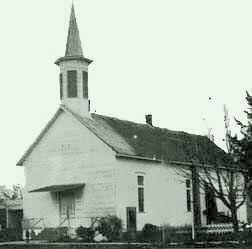 Stayton Church of Christ, built in 1881. Historian Swander places the beginning date for the Stayton Church at 1881 and their own 1881 report agrees with this date. This is 10 years before the charter for the town was adopted. The group was organized with 14 members, some coming from the old Mill Creek Church. Late in 1881, they reported 30 members and E. W. Barnes was the circuit-riding preacher, coming one Sunday each month. By this time, their property was valued at $1,250, so the building was evidently constructed during the Spring and Summer, before the Fall report. A person on location described the building as 30 feet by 60 feet with 18 feet between floors. Was there a second story inside? Early members here included O. H. P. Darby, Louisa Darby, Joseph M. & Polly L. Jones, Elizabeth Jones, Mr. and Mrs. S. A. Jones, Elizabeth Kerns, Augustus Miller, John G. Orchard, Mrs. M. M. Powell, Leah Price, R. E. Richardson, and J. W. Tharp. By 1888 Andrew Jackson Richardson was a member of the congregation and and Samuel Y. Bailey from Garnett, Kansas, was preaching there part-time. Two ushers were appointed in 1894 - A. J. Richardson for the men's side and Retta Shelley for the women's side of the building. In 1895 it was decided that "each male member, the head of a family, furnish in the woodshed, one load of wood ready for the stove." Evidently the congregation did not use instruments in church at first because the decision was made to use the organ in 1889. The records of 1892 show a decision to no longer fellowship with those who "participated in dances and other unchristian devices." By 1898, A. D. Skaggs had arrived as the preacher. (Use our search engine to locate a few of the many places that he preached in Oregon and Washington.) He was asked to go part-time to Rock Point and preaching at Mehama was also discussed. Levi and Emma Rowland had retired in this vicinity. A number of well-known leaders have gone into vocational Christian service from Stayton including Glen Vernon, C. Albert Vernon and Earl Downing. Before 1900, Liberty was a separate community south of Salem. C. F. Swander lists the church as reporting their presence first in 1882, but he did not know where the town was located. Key residents of Liberty were William Preston and Sarah Stanton Murphy. William was the farmer son of John Ecles and Frances Murphy, among the founders of Monmouth and its college. The younger Murphy's home was at Liberty and Skyline Roads and their several "fruit farms" were nearby. Since William "Pat" Murphy was the clerk of the Salem Church in 1867, we speculate they decided to start a church closer to home when they began farming here - hence the church reporting from Liberty in 1882. We find it nothing short of incredible that the present Liberty Christian Church, established a few decades ago, is at the same location today. This historic community in the northeast corner of Marion County was the scene of a pioneer church. It was also called Monitor Mills. Tradition has it that the name Monitor came from the warship of that name. The congregation was organized by Mac Waller about 1887. A building was soon constructed by the new group. Mac Waller discusses Monitor in his Reminiscences. Follow this link. Victor Hoven cited a congregation at Monitor in 1887. J. W. Webb, writing in the 1888 Christian Standard reported a gospel meeting underway. At Monitor, Bro. Burnett, our State Evangelist, and the writer started a meeting; the first three nights , despite rain and muddy roads, we had 2 confessions. I hear Bro. B., who continued it with the help of Bro. Peter Shuck, reports further success. Peter Shuck was a local mill owner and preached part-time. "Bro. Burnett" is Peter Rogers Burnett. In 1889, Mac Waller was the circuit-riding preacher. The church may have had a building because the Disciples of Christ Yearbook for 1892 shows the church owned property. Peter Shuck was also the contact person for another congregation in Marion County. This was located on Silver Falls Highway, four and one-half miles west of the entrance to the park and five and one-half miles northeast of Sublimity. It was on or near Union Hill Road, so was called the Union Hill Church. It is listed in the Disciples of Christ 1892 Yearbook with 12 members. Dr. Swander records the beginning as 1891. This location was close to the Whiteaker Post Office on Silver Falls Highway. This congregation has been elusive because of the several spellings of Abiqua. It is a school house on the Abiqua Creek, just south of Scotts Mills. 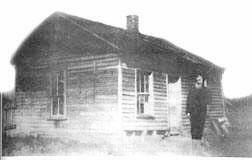 Levi Lindsay Rowland owned extensive property in the area and had donated land for The Crooked Finger School near by. Aumsville, July 18. -- Assisted in the organization of a Church of Christ at Abaqua, Marion Co., on the last Lord's day, with 9 members. Dr. L. L. Rowland was chosen elder and Bro. F. M. Shepard as deacon. This church is a new field, where but little preaching has been done by our brethren. I think good will be the result. I will preach for the church at that point once a month, for a while at least. There is a profile of John Engard Roberts, and a profile of L. L. Rowland. In 1893, the Noble post office was established in that vicinity and the first postmaster was another Roberts, Charles W. Roberts. The Christian Standard of 1893 shows Mr. Roberts moving from Silverton to Noble that spring. Evidently he was both the preacher and the postmaster. Historian Clarence Swander suggests that the church later moved to Scotts Mills or was combined with Scotts Mills after it begain.